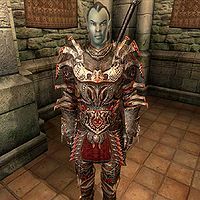 Cylben Dolovas is a Dunmer servant and bodyguard of Seridur. 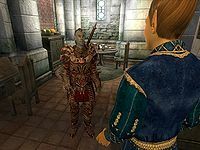 He spends most of his time on the first floor of Seridur's house in the Imperial City Temple District and seems to have a very low disposition with everyone there. Cylben is equipped with a set of leveled heavy armor which will be the best quality for your level. He is armed with a leveled claymore and carries the key to the house, a bread loaf and a large amount of gold. Cylben sleeps from 8pm to midnight. If you've completed The Order of the Virtuous Blood with Seridur dead, he'll sleep from midnight to 5am. He always eats a meal in the basement between 5am and 8am and at all other times, he guards the upper floor of Seridur's house. Cylben is not one for conversations, as he'll always end the conversation after greeting you. Between 5am and 5pm, he will simply tell you to leave his master alone: "Seridur is asleep right now. He's had a long night of study, and is exhausted. Do not disturb him. He'll be up at five this evening." Outside those hours he will instead give a short introduction: "I'm Cylben Dolovas, assistant and bodyguard to Seridur. Let's leave it at that." After slaying Seridur, he'll be rather apologetic when greeted: "I didn't know Seridur was a vampire. I swear! I serve Roland now. Please, accept my apologies for my error in judgement.". From then on, he will consequently greet you with a simple: "Welcome back." This page was last modified on 20 August 2017, at 22:30.